Hello and Happy Halloween! In honor of Halloween today we are featuring Ren Adams of Plastic Pumpkin Designs. 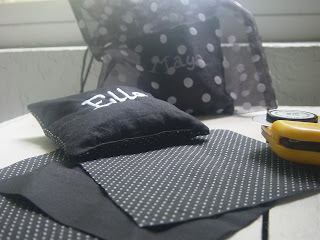 You can visit her shop at http://www.etsy.com/shop.php?user_id=5052970. Ren is located in Albuquerque, New Mexico (USA). She offers fun, philosophical, and intriguing artwork and crafts--for the discerning (and playful) collector. She works in a variety of mediums: mixed media assemblages, pencil, marker, acrylic, Chinese brush painting, watercolor, oil pastel, pen & ink, etc. She finds something special and engaging about each artistic method and takes every medium seriously. "I've been doing artwork my entireLong life (even scribbled in my own baby book) and for me, it's more than a "hobby" or "job" it's a state of mind and a fulfilling pathway. I can't NOT do it. I simply must. If I'm not drawing, painting, or otherwise expressing myself (however badly), I'm not in harmony with everything around me.Art is a sensation, a sense of humor, a sense of elation, a tantalizing window... it's pure energy, pure thought, and pure darkness, and pure light.I explore themes, people, and places that intrigue me...I'm also a Taoist and a lot of my artwork reflects my spiritual pathway (the art of compassion, simplicity, and patience). I practice Qi Gong meditation and enjoy artists who aren't afraid to be themselves." 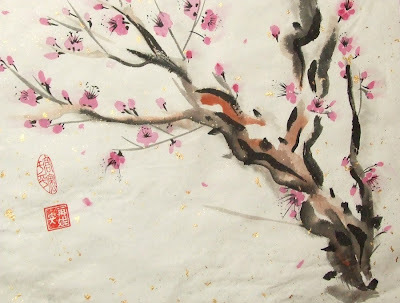 The piece above is called "Plum Blossoms" and is apart of Ren's "Etsy Pink" collection. Ren is doing something so neat! If you purchase a piece from her "Etsy Pink" collection 50% goes to Susan G. Komen Foundation! Isn't that wonderful?! Plastic Pumpkin is FULL of reall unique artwork! Be sure to check her out! It’s a perfect day for ordering your Holiday cards! I know you’ve been meaning to send out more cards to all those friends and family that you don’t keep in touch with as well as you should, and today’s the day to get started. 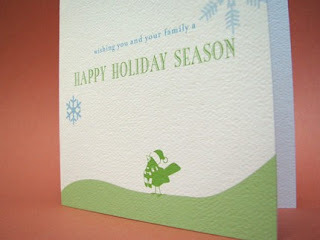 I have the perfect place to pick up simply stated, elegant Holiday cards, http://earmark.etsy.com/ (and brush up on your Spanish). How’s this for a mission statement?! We are here to create happiness. We strive to bring out the creativity and imagination in you. Our first and foremost goal is to make you, the client completely pleased, not only with our product but with our service. We will do everything we can to make this process a smooth and pleasurable experience for you. No matter what your request is we will work to accommodate everything your heart desires. Well, my heart desires the “Create Happiness” and “How’s your being?” cards, as well as a set of those Rood Besnuffeld Reindier Holiday cards with which to spread holiday cheer and great design with all my friends and family during this Holiday season! So, what are you still doing here?! Go check “purchase cards” off your about to be a novel Holiday to do list! 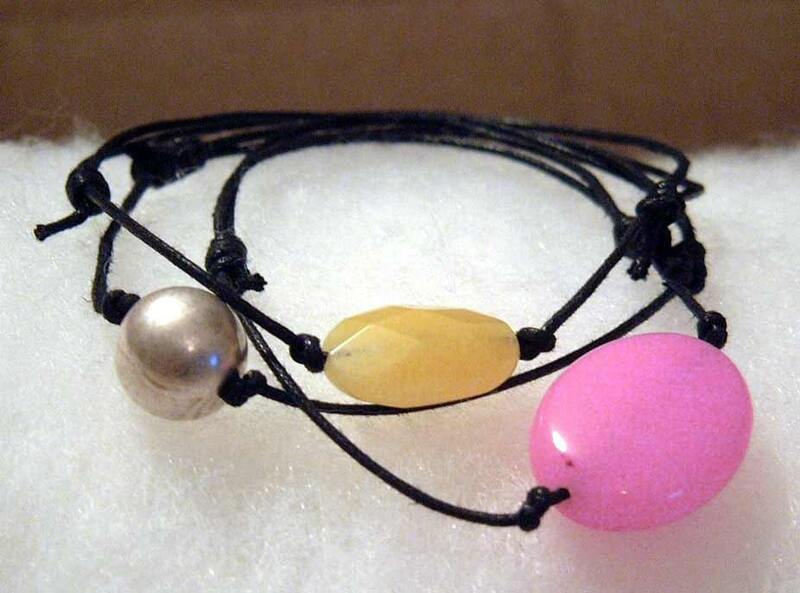 There’s something about the color combination of the pink jade, honey jade, and silver plated ball in this bracelet that really appeals to me. I only wear uncomplicated jewelry, so I enjoy the simplicity of each of the three separate pieces as well. Born in Paris, Kalicat, the creator of this piece, is an artist and illustrator. She lives in London, but her work can be seen all over the world, including Spain, Zambia, and France. Her Etsy shop, http://kalicat.etsy.com/ hosts this and other beautiful beaded and gemstone jewelry. She also has some unique sterling silver pieces that would be perfect every day adornments. Visit her shop by clicking the link or the picture above. Today’s featured artist and Mom to three 12 year old boys (yep, triplets! ), is Michelle a.k.a. Shoozles. In her Etsy shop, http://shoozles.etsy.com/ Michelle sells her beautifully fused glass works of art. This quirky little piece has a sense of humor all on its own. It’s a single layer of “blood soaked” enamel and a heart charm. Despite its ominous appearance, Michelle thinks the jingling sound the pendant makes when it’s worn will bring you good luck… she feels lucky every time she makes one and it doesn’t break! Check out all of Shoozle’s wearable art by clicking on the link or the picture above. 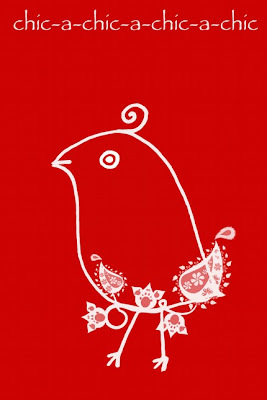 So, since my daughter, Ava's nickname is lil' bird I found it only fitting to feature this print by Jansing. You can visit her shop at http://jansing.etsy.com. She has all sorts of unique prints! This is what Jansing has to say about herself; "So, I finally found my niche. I like all things kitsch, eclectic and whimsical. I enjoy painting, drawing and other artsy stuff. Most of all I like colours, red, pink, green, black, white, grey, you name it. Love it!" I'm sure that after you check out her shop you'll agree that she certainly has "found her niche". "I'm a simple girl with dreams of being a jewelry designer in Paris. Finally have a life here; making jewelry and trying to break into the scene. Inspired by life experiences and daily beauty in Paris. Love of travel and adventure create a wide canvas from which to dream and imagine new designs. handKrafted jewelry designs are my specialty. I use a high temperature propane/oxygen torch and fine Italian (Effetre) glass to make unique beads, then use those beads in hand created sterling silver pieces. All my beads are made free-hand, without a mold. 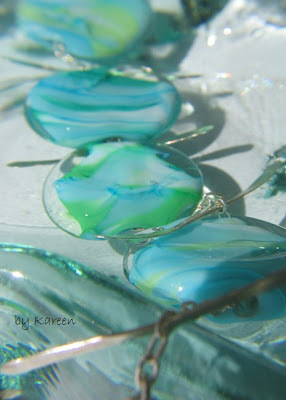 All beads are kiln fired for strength and durability. Prior to leaving Santa Monica, my jewelry and I were featured on HGTV's Crafters Coast to Coast.My mother is from Tahiti, so you will find that many of my pieces include blues and greens....coming nowhere close to the intensity of the colors in paradise. I spent summers in Tahiti while growing up in LA, and recently received my diving certification while there last year. I hope you enjoy what I create. " The piece above is entitled "Variegated Seas" it is a bracelet crafted from five glass beads. sterling silver wire (handformed) and sterling silver findings. Isn't this photograph beautiful!?! Be sure to check out Kareen;s shop for lots of rare finds! Studio Marcy offers unique & very personal treasures. 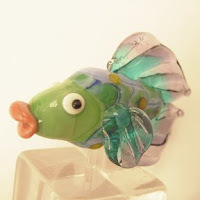 Marcy's creativity & love for her art shows through in each piece she designs and we must be near the same wave length because she's recently listed this lovely fish named Ellie in her shop as well as a whimisical little monkey named Bella too. Pretty easily. My shop name is my name, "Marcy" combined with Studio. I wasn't sure whether I'd be offering more than just my art glass, so I wanted to keep it flexible. Oh, this is the first time I've admitted it, but I have a "thing" for handbags. Especially the retro prints. I just love them and the little zippered bags. It's an addiction, I think. My inspiration comes from all over. I see glass beads in fabric, people, situations, books, nature and so much more. My studio looks out on my garden and bird feeders, which is why I have so many birds in my work. I remember making a breakfast tray for my mom in Kindergarten. I still have it. Be sure to checkout http://studiomarcy.etsy.com/ for a new take on the everyday BEAD! 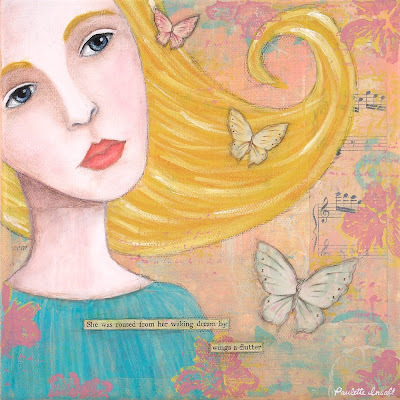 Like many other artists, Paulette Insall has been creative from a very young age. From making knotted bracelets and hair accessories as a child to taking photos for her high school year book when she was older. She never thought of herself as an artist until a few years ago. For many years she dreamed of painting, but could never bring herself to pick up a paint brush until October of 2006. That's when her love of creating stories with paint and paper began. The piece above is one of my personal favorites. It's entitled "Waking Dream". "A Waking Dream" is an original poem by Paulette Insall. She was roused from her waking dream by wings a-flutter,the path now so clear before her,............the transformation underway...................the discovery of part of herself that had always been....Waiting...............to awaken................to bloom....................to soar.Choosing...............to let go................to give in....................to breathe.Her purpose was clear, her heart.......at peace. Please check out Paulette's works at http://pauletteinsall.etsy.com/. 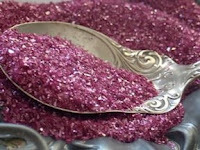 If I could will myself to be creative on the spot, it would be right now as I look at this beautiful german glass glitter for sale in Wanderlustnpixiedust's Etsy shop. The wheels are turning and here's what I've come up with so far: Christmas ornaments that glitter like diamonds, special greeting cards for friends and family, the perfect embellishment to a simple picture frame, covering shells or plastic fruit to display on a centerpiece, even just decorating a shelf with the glitter in a tiny glass vesel. How would you use this glistening medium? Besides german glass glitter, Wanderlustnpixiedust has other items to inspire your creativity, like a collection of orange and black trims and embellishments packaged in a chinese take out box. Check out Wanderlustnpixiedust's shop and get inspired! What a lovely bag! It has drawn much compliments from my friends. Quick response and fast shipping, I will surely buy from the shop again. KatelynJane calls her bags Kitty bags, and of course she’s getting great feedback with ones like this in her shop! KatelynJane loves fabric and when she spots the right color or texture, she can envision one of her bags made out of it even before she takes it off the bolt. I think this bag is quite possibly the first bag to be simultaneously punk and elegant. The simple styling puts focus on this glitzy fabric and it’s roomy enough to actually be functional too. Add one (or more!) 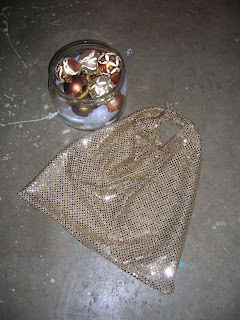 of KatelynJane's Kitty bags to your holiday shopping list. Your sister, your Mom, your girlfriend... whoever is the lucky recipient will thank you! 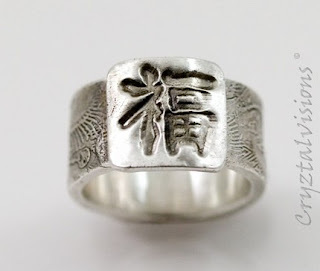 Handcrafted of Fine Silver (99.9% silver) Wide Band Ring with the Japanese Kanji of Prosperity & Good Fortune. The wide band features a beautiful and delicate feather-like texture. The band is approximately 3/8" wide. Each ring is hand polished and a patina is added to bring out the texture and accentuate the Kanji symbol.FukuThe kanji symbol FUKU, which means FORTUNE and WELL-BEING, is the image of a stone jar filled with food or wine. This feeling is familiar to all of us. When plenty of wine and food is stored we feel comfort and have confidence in the future.I suggest wearing the symbol upside down which signifies "good fortune has arrived". Don't forget the "Z" (it's cryztalvisions) when you go to check out this shop on Etsy. This Etsy artist was inspired by the passion for geology, nature, gemstones, and crystal of some of her childhood teachers and even added the Z to her shop name as a homage to one of those teachers who pronounced crystals as creezzztals. 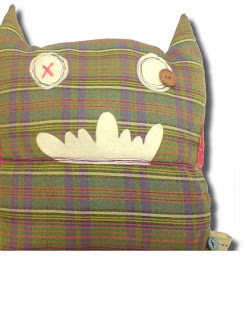 Dina Cuomo is a newcomer to Etsy. She has loved jewelry and gemstones all her life. Her travels to Greece and Greek background have influenced her love of 18k and 24k gold and her choice to work with gold vermeil. (24k over sterling silver) She makes one of a kind jewelry pieces to accommodate many different styles and fashion trends. Although she began working with stones over 10 years ago, the demands of a full time teaching job and childcare did not allow her the time to follow this passion. Finally, the timing seemed right and she started creating and selling her pieces. And aren't we glad! The piece to the left is called "Falling Leaf" and I think it would make a perfect addition to anyone's fall wardrobe! You can check out Dina's Etsy shop at http://Elektrajewelry.etsy.com. At Elektra Jewelry Design you can find jewelry to suit your personality and mood. All the pieces are handmade. Dina never duplicates designs so each piece of jewelry is truly one of a kind. All items are sent in organza pouches or lovely hand printed paper packages ready to enjoy or give as a gift. 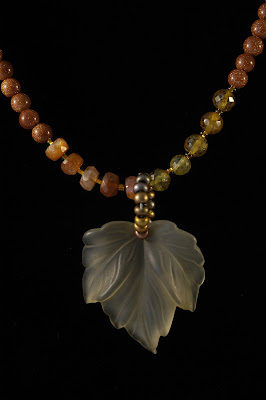 Dina has many pieces that would make beautiful gifts, so please make a stop by her shop! This evening we are very excited to introduce you to Lunachick! You'll find her shop at http://lunachick.etsy.com . Each of her designs combines quality materials, including natural gems, precious metals, crystal and organics such as pearls, amber and shell, to make for a truly unique wearing experience. Her shop offers lots (count em...LOTS) of one-of-a-kind artisan jewelry pieces. From bracelets to chokers, earrings to necklaces, She's got something to please just about everyone here. I fell in love with these earrings! 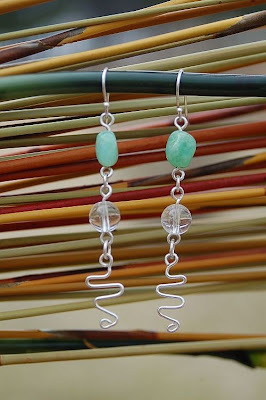 These earrings were created using apple green chrysoprase nuggets, rock crystal rounds and hand formed sterling silver squiggles. Lunachick's shop is full of unique and one of a kind pieces! So please go check them out! To begin this unique photographic art I capture an image on slide film. The slide is then projected onto Polaroid pack film which is peeled prematurely. The “waste” side of the film pack, which contains processing chemicals, is then placed face down onto wet watercolour paper and brayed (rolled over with a print making brayer). The result is a one-of-a-kind hand-pulled photographic transfer of the original slide image. The original image can be transferred an unlimited number of times but the resulting transfer will always vary from the last. I picked this picture because I know several women who are pregnant right now, so it's been on my mind lately and also because I absolutely loved being pregnant. It was one of the best periods in my life and I even loved my round baby belly. The soft, warm, muted tones of this photo are a beautiful depiction of this special time in a women's life. 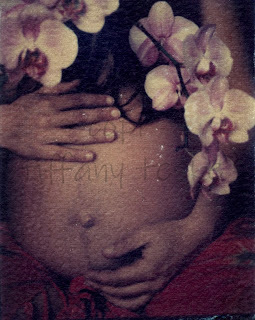 Check out Tiffany's other photos (like one entitled ferntebrae that illustrates the relation between nature and the human body) at her Etsy shop http://tiffanyteske.etsy.com/ or by clicking on the picture above. With over 30 years of experience Karen Copeland is our featured artist today! She is a crafty mother of four! Karen was introduced to Etsy by her sister who had recently gotten into candle making. When asked what was the first thing Karen could recall creating she responded "I think it was Mr. and Mrs. Santa Claus, made from folding old reader's digest then spray painting them and putting a Styrofoam ball on top and decorating!" Some more of my favorites from Karen's shop are "Sammy the Scarecrow", and a husband and wife set of bunnies "Rupert and Renee". I'm certainly glad Karen joined the Etsy community, and I'm sure after you visit her shop you will be too! Q - What inspires your products/creativity? A - Children, I love how innocent children are and how they think anything is possibly, so I get them to draw things for me and I make them into toys, and teddies, the eyes are brilliant! Also my husband, he doesn’t have a clue how to sew, and just suggests the most random things and sometimes that inspires me to create other things…I hang cut outs from magazines, postcards, pictures, photo’s of anything on the walls of my studio and it always helps to keep these beautiful things around me…. Zoe also has an adorable apron and a lavender scented heart sachet (it woud be too sweet hanging in a quaint country cottage) listed in her shop. 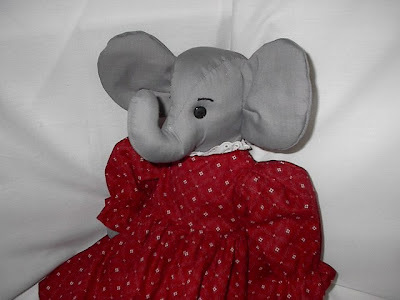 She’s adding more creations to her shop soon, like friends for Henry and more lavender goodies for Christmas. I can’t wait to see what she comes up with next! Click on the link or the picture above to check out her shop. Although jewelry shops are common on Etsy, it's uncommon to find a shop with a fusion of materials and a range of design like the Becki's Designs shop. 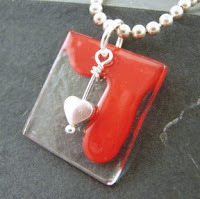 She has a beautiful variety of jewelry styles that are inspired by "glass boxes at thrift stores with old jewelry in them. Nature: Trees, seasons, fish (my aquarium) water, rocks and wood". 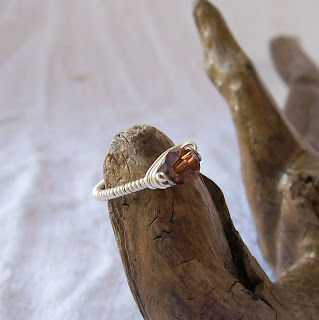 The diverse selection ranges from delicate crystal strands, my personal favorite a necklace that mixes chunky wood and faux pearl beads, to this stunning smoked crystal wire wrapped ring. There are several reasons I specifically featured this ring. It's elegant and sort of edgy at the same time. Just looking at the smooth coils on the band makes me think about how comfortable it must be to wear. Becki's not only artistic with her jewelry, but also with the pictures she uses to display it, they're as fun to look at as the jewelry. I also really like that she has included a picture of the ring on a sizer so that you know for sure what you're getting ahead of time. Click on the picture above to check out the listing for this ring and the Becki's Designs shop. 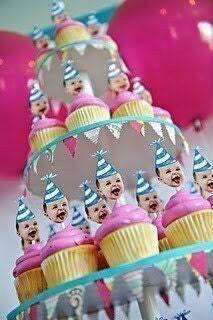 Just last week, we celebrated my daughter Elle’s 2nd birthday with lots of friends and family and Music with Mar. Mar is a very talented woman who lives here in the Tampa Bay area and has written and recorded some wonderful children’s music and developed a class that parents can bring their children to. Elle & I listen to Mar’s CDs in the car all the time, and love to go to Music with Mar classes to play and sing together. Mar said the other day “Elle’s in her very own “Music with Mar” world when she’s here” and what a happy world it is! One of Elle’s favorite Music with Mar songs is The Beanbag Groove. 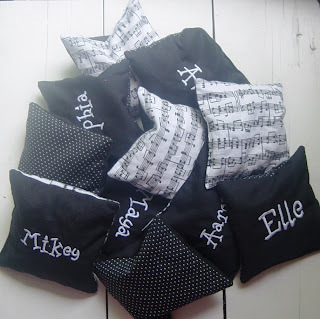 I made beanbags to include in the kid's favor bags with their names embroidered on them. 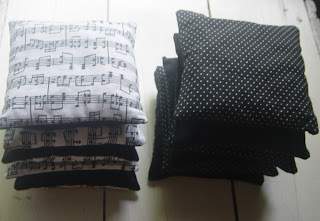 Once again my little one has inspired another Elle Belle product, and I’m looking forward to making another set (in a more child friendly fun print – I made these in black and white polka dot and music notes because that was theme for Elle’s party) very soon to list in my shop. These beanbags fit so well with my desire to encourage my daughter’s curiosity and imaginative play. I am continually surprised by how creative her little mind is, even at only 2 years old. It’s so important to me to find toys for her that help her think on her own and provide more than just entertainment value. She’s been zipping around the living room while trying to balance the beanbag on her head, throwing it onto the wood floor to hear it splat, mushing the beans around with her little fingers, shaking it to a rhythm, counting each one, using it as a pillow for her dolls, pointing out the letters embroidered on them… it’s wonderful how even the simplest things can provide hours of enjoyment… and it didn’t even require batteries! The finished size of these beanbags is 4x4 and I filled them with navy beans (they had a nice feel and make a good sound when they shake). They're so simple to maket, my only tips for you if you’re going to make some yourself is to set your stitch length shorter than usual to ensure there’s no gaps for beans to slip through and not to make the opening that you turn them through too small or it’ll be more difficult to pour the beans in. I made a “funnel” out of a piece of card stock to pour the beans into the bags, and didn’t fill them up too much so that I could top stitch them closed on my machine (I avoid hand sewing at all costs!!). Have fun and if you don’t want to do the work yourself, or can’t embroider on them yourself, check out my website http://www.ellebelleonline.com/ or Etsy shop ellebelleonetsy.etsy.com to buy a custom set for your little one. I hope to have them posted by the 15th.